Hello folks, and welcome back for another update of the Forgotten Hope Mod. 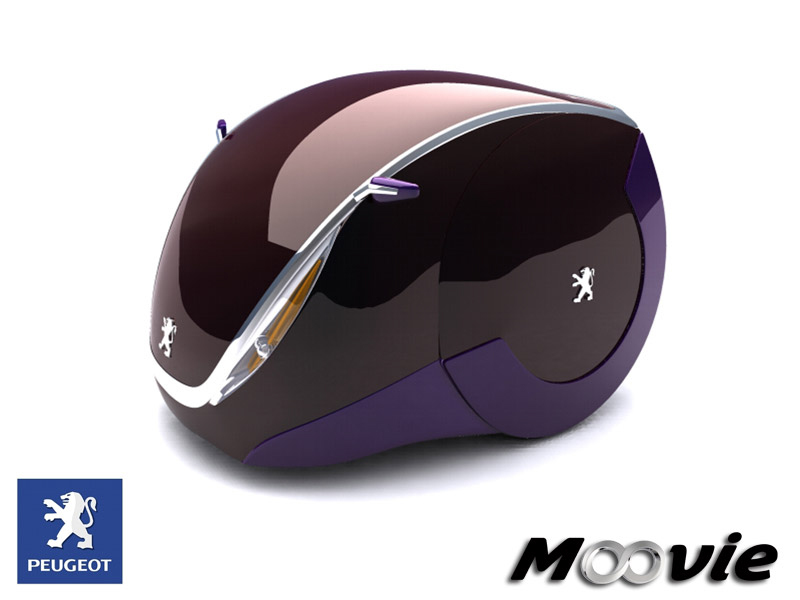 First of all we are proud to be able to tell you that our member Lude won the 3rd Peugeot Design Competition. He was able to prevail against 9 rivals with his idea after he made it to the finals before where only 10 out of 3800 entries from 170 countries were chosen for. We would like to pronounce our congratulations and our best wishes to our member and friend. You did a great job. Keep it going! Next good news we have for you is that our team has grown by one member recently. The newest Padawan we have is K96 and he will work in the 2D & 3D arts. It is good to have him aboard as we will need lots of help in preparation for Forgotten Hope 2. You can look forward to some of his first efforts for FH in the near future. And now it is time to show some more development progress. Many of you might remember the mapping contest a while ago. 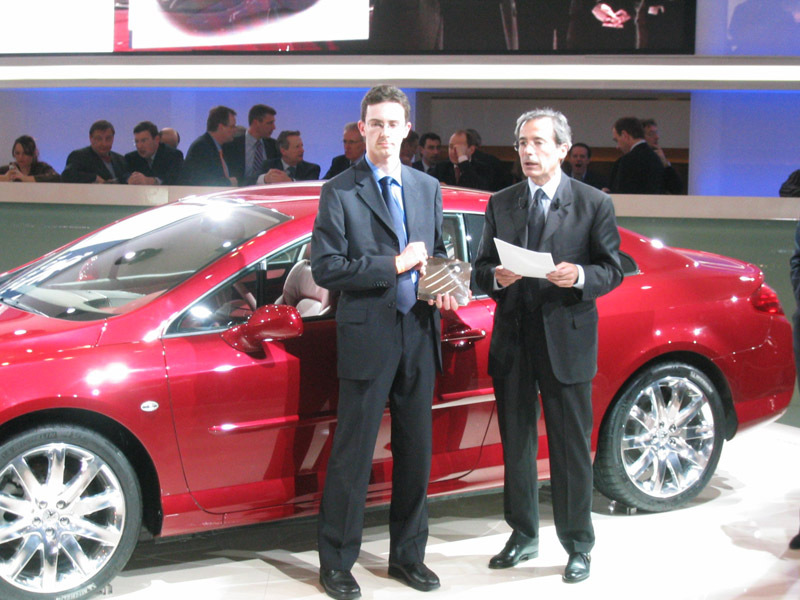 The price offered to the winner was a static and a vehicle of choice. The Orthodox church static was already shown in a former news update, but we still owe the winner mArs his vehicle. His choice was the Soviet T-26 tank used in the early war years mainly for infantry support. Montoya created this prize, so that contest winner could finally receive his reward. After heavy losses in early part of the German invasion, most T-26s were converted to artillery tractors and a few were even filled with explosives and used as radio controlled mines. We saved the best for last - the introduction of the first armoured pieces for the Italian army. First of all we have the backbone of the army with the M13/40 tank. Weaker than the better German tanks, it proved to be unreliable and prone to catching fire, although it's 47mm cannon was good enough to deal with most of the British armor. For that reason the British used any of the M13/40s they could capture and had more than 100 hundred of that type in service. Forgotten Hope will have it in its service thanks to Montoya. 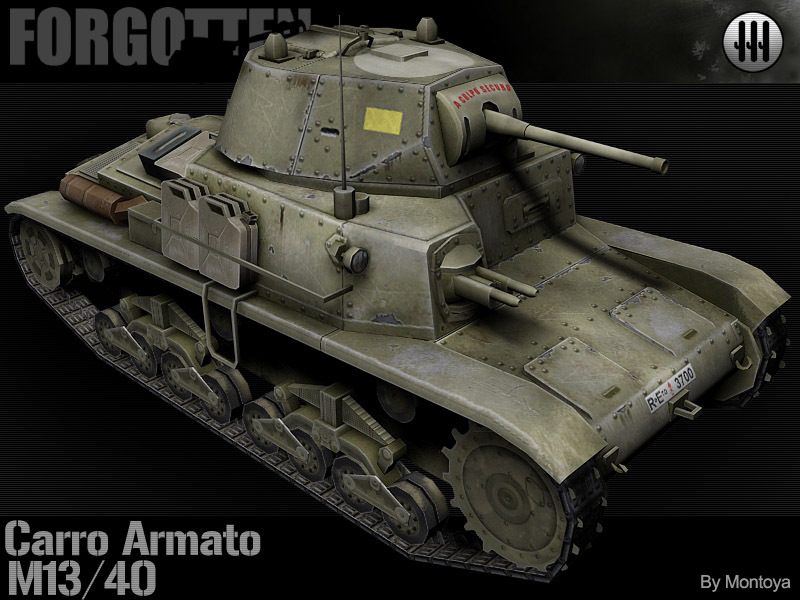 Later in war the Italian Army ceased the production of the Carro Armatos series tanks and used their chassis for the production of the Semovente da 75/18 Su Scafo M 41 assault gun. 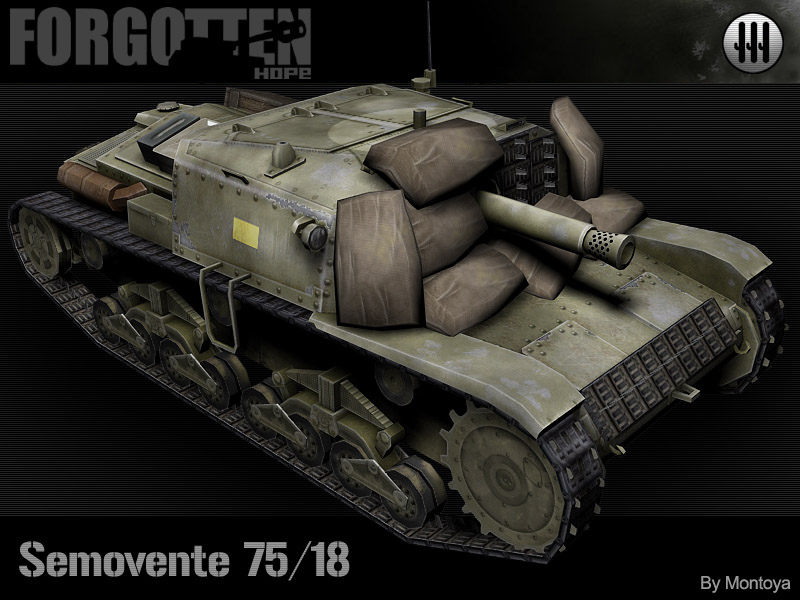 Based on the model of the German Sturmgesch�tz III this vehicle was by far better than the CA. Armed with a 75mm cannon it was mainly used as artillery and tank hunter by the Italians. Later most were taken over by the German army, which used then primarily as long range artillery owing to the difficulty of maneuvering them in the mountainous regions of northern Italy. Once more a vehicle created by Montoya. That's all for today folks. Stay tuned for more information about the mod development progress on the next weekend and give our public forums a visit to discuss this one. Hello folks, and welcome back for another update of the Forgotten Hope Mod. First of all we are happy to announce the expansion of our homepage to include nine additional languages. We are an international mod with developers and fans across the globe, and we are happy that more of them can enjoy our website in their language of choice. Our thanks go out to Gro�admiral D�nitz (Dutch), Arisaka, Winther, Gauntlet (Norwegian), Liquid (Chinese) and MkH^ (Finnish) for help with translations. Great job guys! Sometimes your pathway leads to a crossroads. Then there is the need to make a decision. A decision based on a mix of knowledge and speculation. 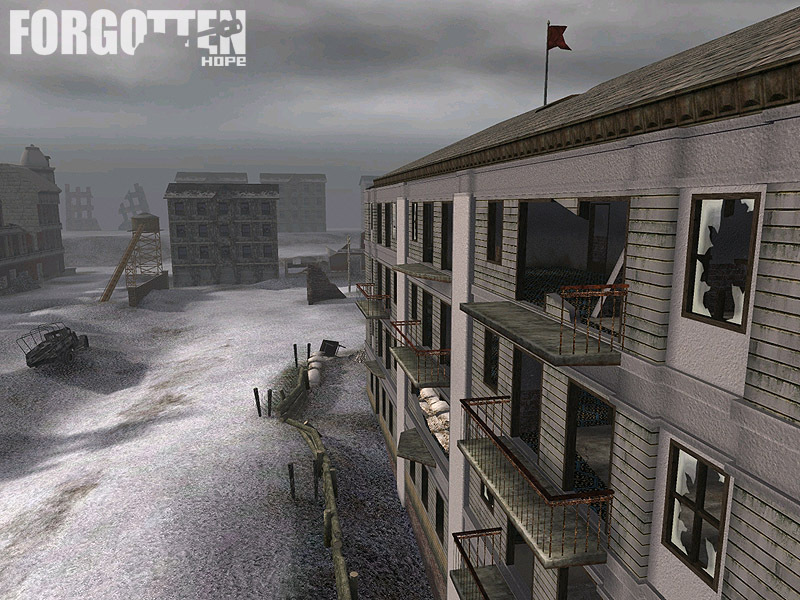 The Forgotten Hope developers have known about the biggest crossroads coming up for a while now, as have our fans. 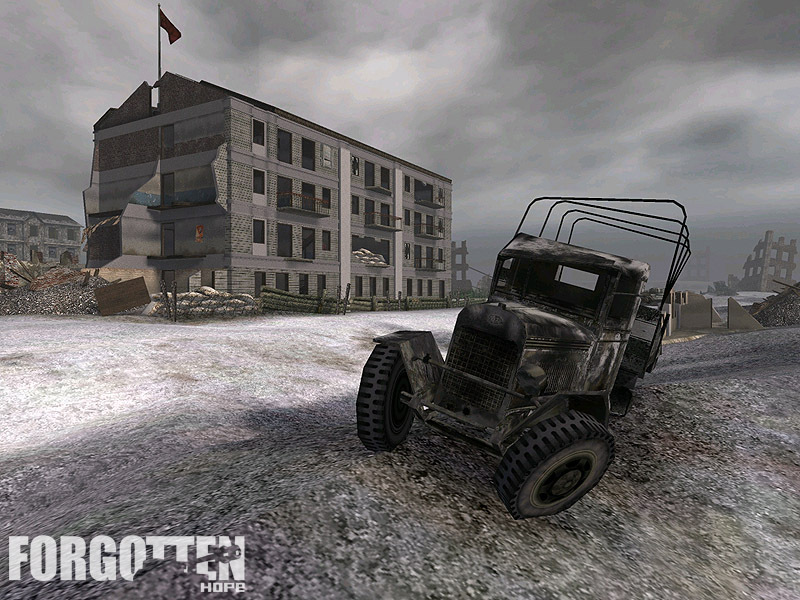 The decision to be made was whether to stay with Battlefield 1942 or to move on to the upcoming Battlefield 2. As it involved big changes and because many details were unknown, we put off making a final decision. But with every second passing by, the crossroads came closer and time grew shorter. 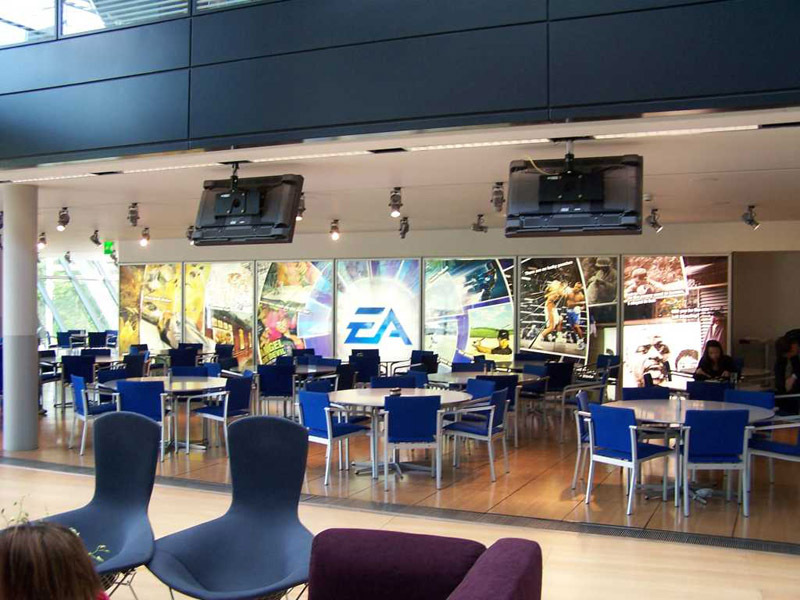 But, as fate would have it, Electronic Arts offered us a chance that we could not pass up. Finally, after months of possibilities and maybes we were able to have a closer look on the latest iteration of the Battlefield series. 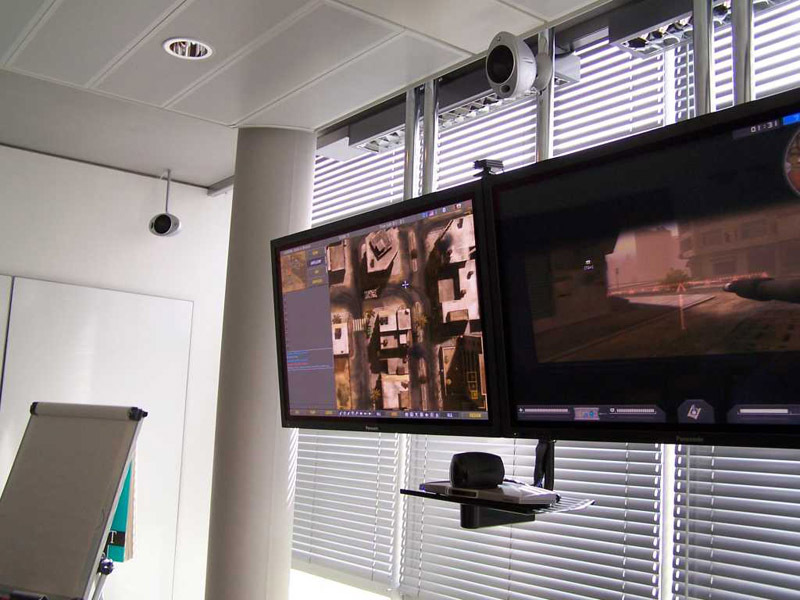 Flying in to the United Kingdom, Armin Ace visited an EA development studio together with several members from other mod teams for a two-day trip full of information, presentations and experiences. Right afterwards, many made a stop at Berlin to join the EA Community Event. News posters from the most known German community pages and developers from all sorts of mods reported in, as did our own news poster BUG$. Electronic Arts� new approach to the modding community should be a big help for every mod, and we expect a quick start when modding for BF2 as the development tool should outshine every editor known to us. 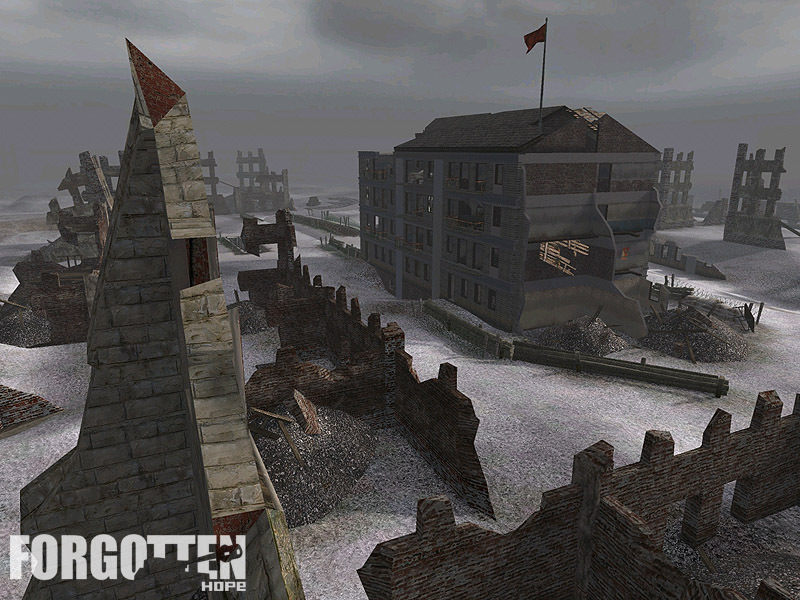 And additionally, we look forward to features that are already available, like limpet mines, different damage models depending on the current state of vehicles, artillery strikes, teamplay oriented game features in form of the command mode and squads, and, last but not least, beautiful graphics. 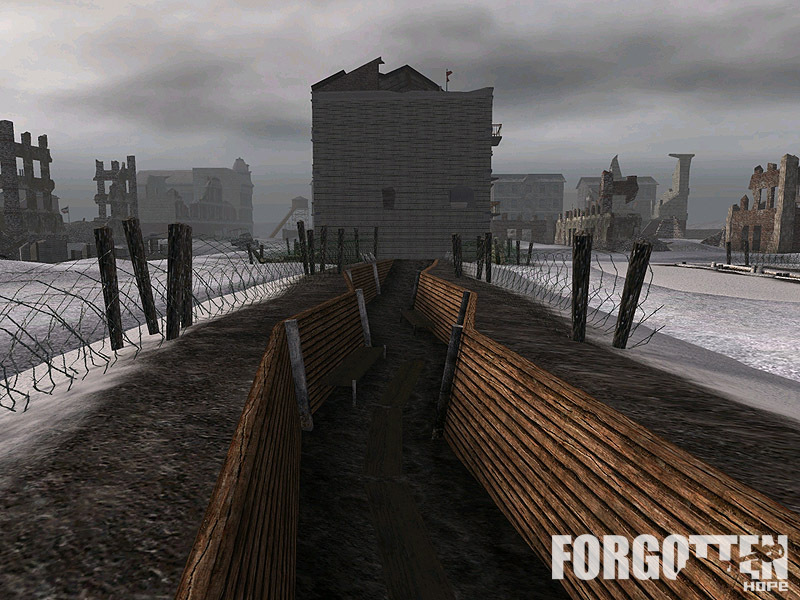 You can now look forward to intense battles of the World War II with tomorrow's engine in the upcoming Forgotten Hope 2. Hello folks, and welcome back for another update of the Forgotten Hope Mod. We are sorry for being late this time, but as BUG$ was at home for some private business the news had to wait until now. Anyway, we hope you will enjoy this update like wine - the longer you wait the better it gets. First object to show is the completely redone British medium tank Cromwell Mk. IV. 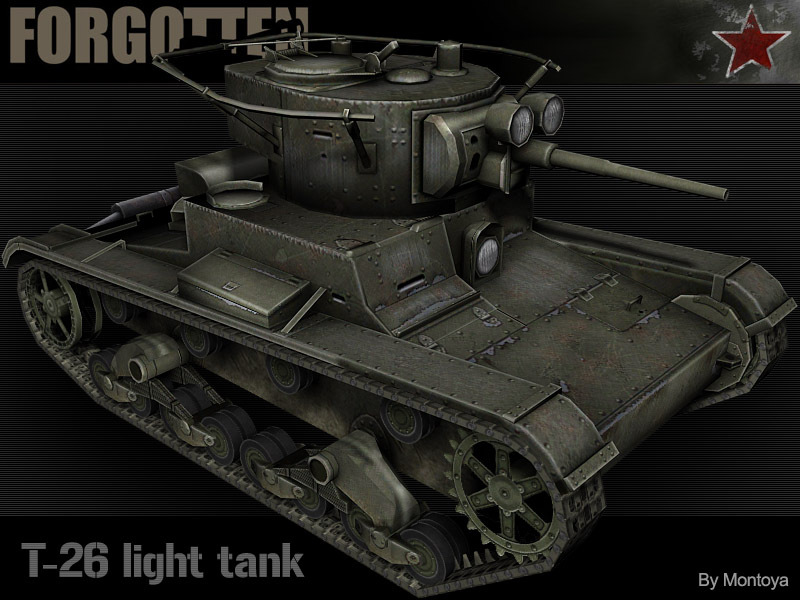 Malsa created the model and Montoya made the skin for the backbone of the British tank divisions. Mainly built in the last years of the war, the Cromwell was equipped with a 57mm ROQF 6-pounder Mk. III main gun that was later replaced with a 75mm cannon, as more firepower was required to penetrate the armor of heavy German tanks. Although it will still be hard to defeat the enemy tanks, you will at least look better while doing it. Second thing we want to showcase today is totally new. 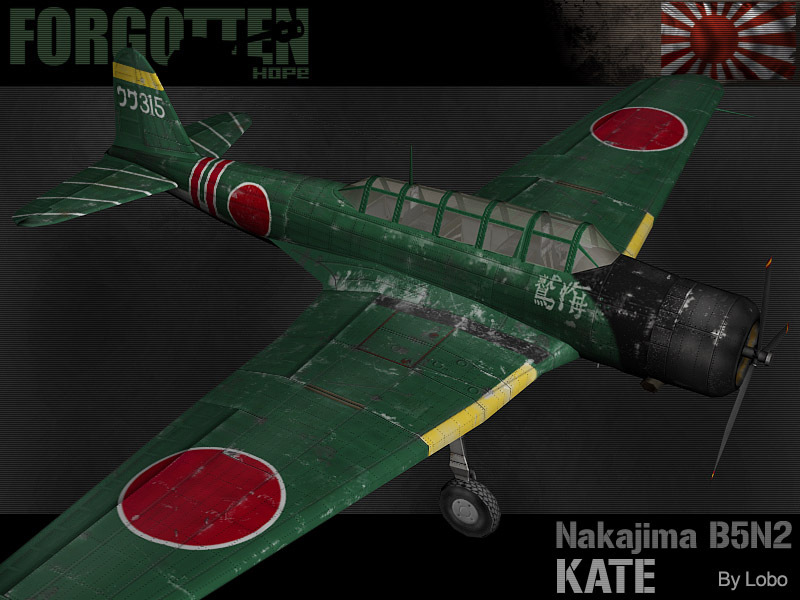 The Japanese Air Force will be reinforced with the Nakajima B5N2 better known under the name Kate made by Lobo. This warbird is a further stage of the B5N1 as the former version was too vulnerable against fighters. As most Japanese aircraft, the Kate was most successful during the first years of the Great War. On December 7th, 1941, 144 B5N2's torpedo bombers were among the Japanese attackers at Pearl Harbor, and these made short work of the US fleet anchored there. 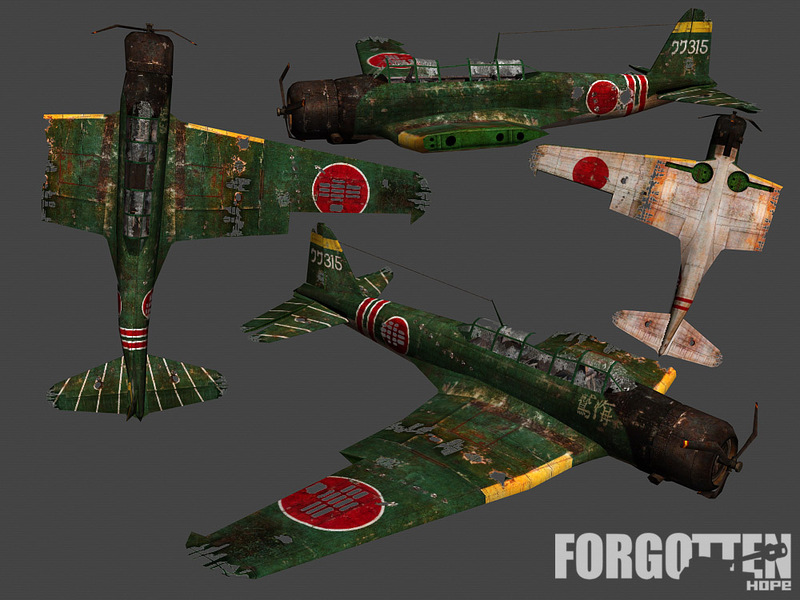 But as we have such a beautiful wreck model, the pilots won�t mind too much about being shot down. Taking out nasty American tanks will be a breeze with the Type 99 AT "Turtlemine". This magnetic explosive device carried 1.5 pounds of 50-50 RDX-TNT. 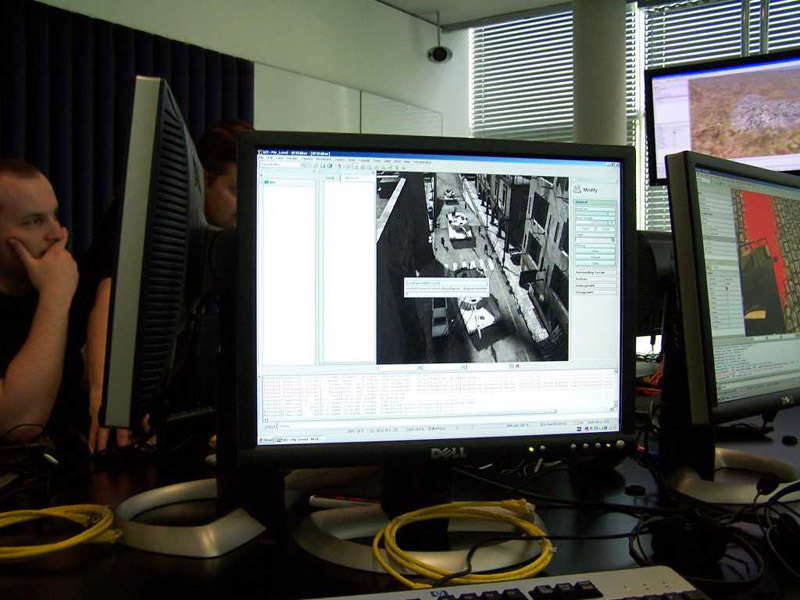 Although commonly referred to as a "mine", it had a delay action fuse that was manually set. As with the German magnetic and sticky grenades, these were manually operated and deployed to attach themselves to metallic tanks (unfortunately, this feature will not be possible for bf1942, instead they will act in the same fashion as satchel charges). Thank McGibs for creation of this fancy toy that will help the Japanese infantry to hunt down enemy armor. 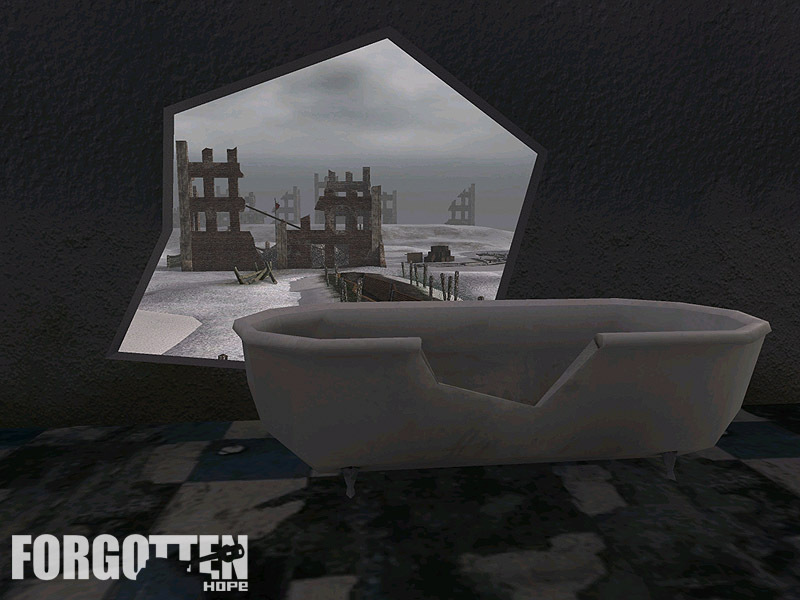 Hello and welcome back folks for another update of the Forgotten Hope Mod. Tonight is a historic night as we celebrate the 60th anniversary of VE-Day (Victory-in-Europe Day). The German Chief-of-Staff, General Jodl, signed Germany's unconditional surrender to the western Allies and Russia yesterday 60 years ago at 2:41am and the operations were to cease at 1 minute after midnight (GMT) on the following day. In deference to the Russians, the surrender ceremony to the western allies at Rheims of the previous day is repeated before Marshall Zhukov and other Soviet generals at Karlshorst, a suburb of Berlin. But as the ceremony took a little longer than expected, it was already 00:16am, May 9th, local German time, when the second surrender was signed, which was 2:16am on May 9th in Moscow. For that reason VE-Day is celebrated on the 7th of May in the US as the western Allied forces took custody of German forces in the West by that date, on the 8th in Germany as this is when the main fighting finally stopped by local time, and the 9th in Russia, according to the time standard being used by the Red Army. For our news update we would like to introduce something new for the Russian forces today. The first object to show off today is the PPS-43 (Pistolet-Pulemet Sudaeva, or model 1943 Sudaev SMG) modeled and skinned by McGibs. It was developed as a more compact and mobile weapon than the PPSH-41, which was considered too big and too heavy to be used by tank crews, mobile recon groups and paratroopers. Aleksei Ivanovich Sudaev initially designed a new SMG in 1942 and the final model was designated the PPS-43. 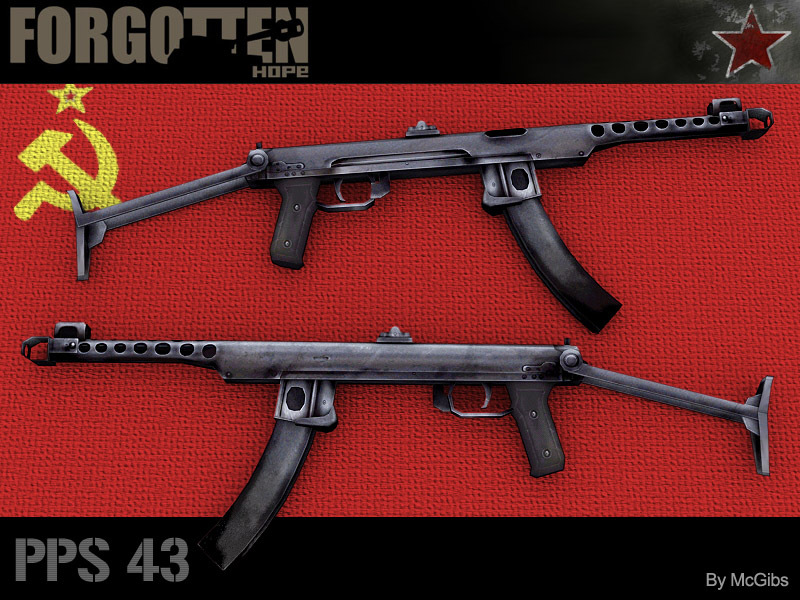 Sometimes is referred as the best SMG of World War 2, the PPS 43 was exported to pro-Soviet regimes around the world and widely copied after the war. Technically, the PPS-43 is a fully automatic weapon fired in full auto only. The sight is an L-shaped flip type and is marked for 100 and 200 meters distance. The SMG uses PPSH-41-type box magazines (35 rounds) and has a rate of fire of 700rpm. All in all it is a remarkable weapon to play around with. Furthermore we would like to showcase a new map. 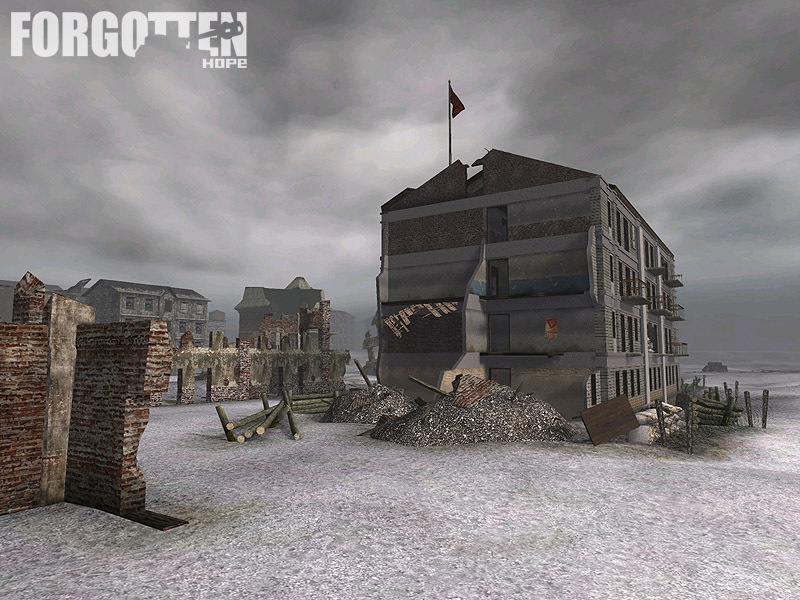 The first map completely created by Lobo on his own, it features Stuka's Stalingrad building textures and was made in deference to Sergeant Pavlov and his platoon, who defended one house in Stalingrad against heavy attack for an extended period. The house was a four-story building in the city center, built parallel to the embankment of the river Volga and overseeing a large open space, the "9th January Square". 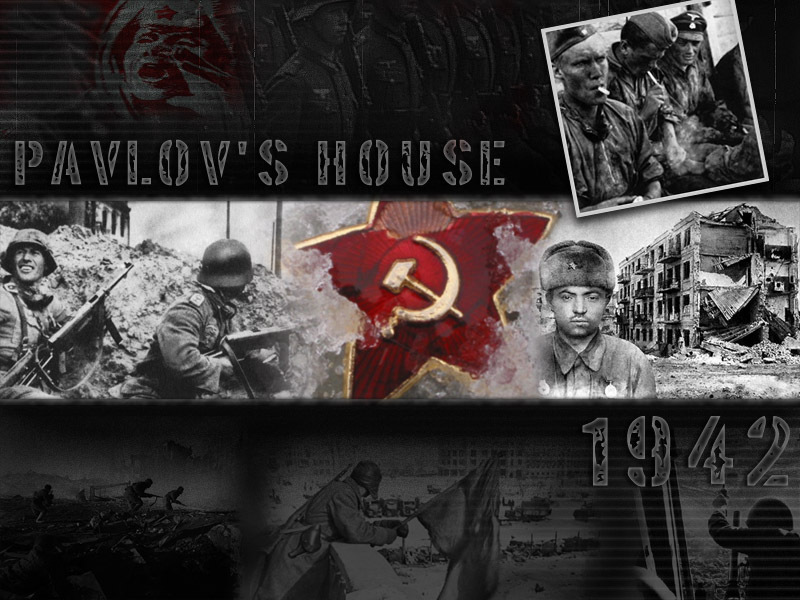 That house, known to history as "Pavlov�s house", became a symbol of the great determination of the Soviets to hold the city no matter what the cost. 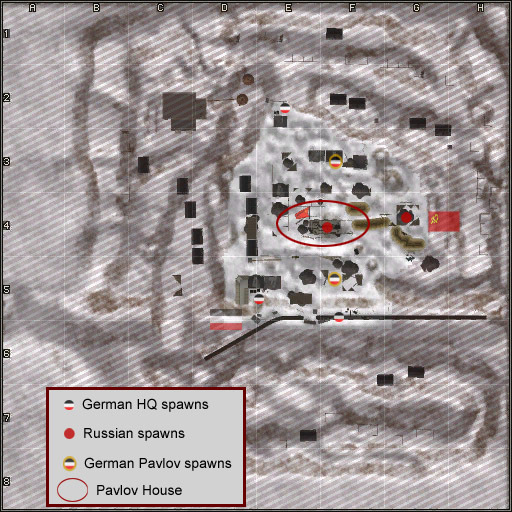 Completely surrounded by Germans, Pavlov�s soldiers held the constantly attacked building until relief came. They were successful, although only four men survived the combat. Together they went on defending the building on their own. After several days, reinforcements finally arrived, equipping the defenders with machine-guns, anti-tank rifles and mortars. The men, now a garrison of twenty-five, surrounded the building with barbed wire and minefields, and established anti-tank and machine-gun posts at the windows. For better internal communications and supplies they breached the walls in the basement and upper floors, and dug a communications trench to Soviet positions outside. Supplies were brought in via the trench and by boats crossing the river, defying German air raids and shelling. Intensive fighting lasted from 23 September until 25 November 1942! That's all for today folks. We hope you enjoyed the update and would like to invite you to visit our public forums to discuss this one or just to remember the victims of the fighting during World War II. 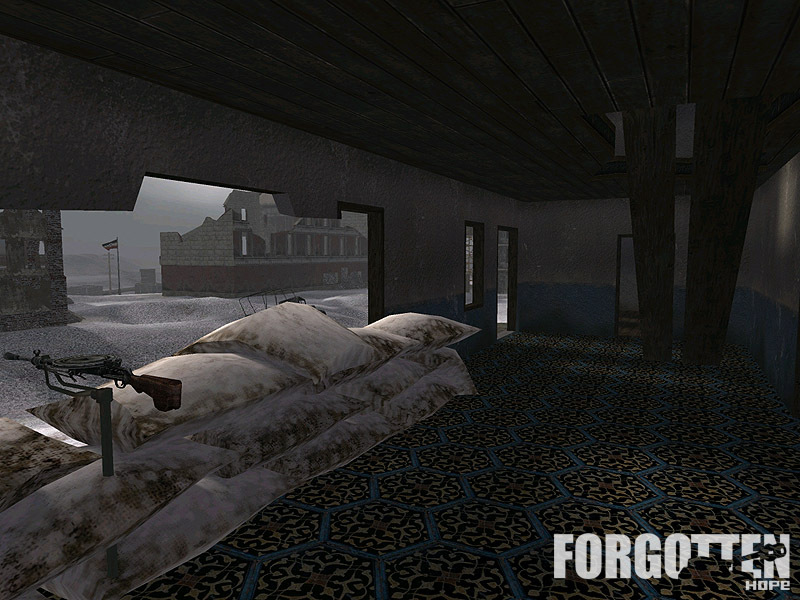 Hello and welcome back folks for another update of the Forgotten Hope Mod. Today we have a bigger update for you than it might appear on the first view. Not only are we showcasing some Finnish equipment today , but the Finns have finally made it into their own section of the website. Expect the Canadians to follow soon after. So take your time and explore the toys of war the Finnish Army has to offer. First of all,� we have the long awaited Suomi M-31 submachine gun. With its rate of fire of 900 rounds per minute and the excellent range of 200m it will serve you well on the field against all enemies. This sweet item was modeled by Montoya and got its skin from McGibs. Furthermore we have the BT42 self-propelled artillery gun brought to the battlefield today. It is based partly on a model by Mudge, and completed by Montoya. Its 114mm cannon will devastate anything within range whether friendly or enemy. So be careful where you address your mail. That's all for today folks. We hope you enjoyed this news update and would be glad to welcome you again next week for another update. Do not forget to stop by our public forums to discuss this one.